Page 4SPACEPORT NEWSFebruary 25, 2000 Security remains full-time concernWorkers vigilance keeps KSC safeProtecting Space Shuttle crews on launch day is only one of many tasks performed by KSC security personnel, who control all access to the Center. As hundreds of employees stood in the parking lot outside the Headquarters Building on a Thursday afternoon, there were plenty of sources for possible frustration. Having been abruptly evacuated from the building, the employees could do nothing but talk to each other. They had to wait for KSC security personnel to allow them back into the building. And though it was near the end of a shift, the employees were not allowed to get in their cars and drive home, either. In spite of that, few complaints were heard and that fact above all shows a general understanding about the importance of security at the Center. Everyone was very cooperative, even though it was late in the afternoon on the day prior to launch and the evacuation interrupted numerous meetings and inconvenienced many. The evacuation, which drew attention from local newspapers and television stations, offered a conspicuous indication of the security measures that are in effect 24 hours a day, seven days a week at KSC. As the NASA Center with the most valuable collection of launch architecture and space flight equipment, KSC maintains a level of security higher than those at most other centers. Even with a well-trained security force, the Centers well-being depends largely on the vigilance of the workforce itself. That security awareness was at the heart of the Feb. 10 incident, which proved to be a false alarm. Two of KSCs employees reported to the NASA Security Office that they had observed two men enter the rear of the Headquarters building wearing parkas (despite 75-degree weather) and carrying backpacks. That report prompted the evacuation of the Centers largest office building. Security officers watched employees as they left the building but saw no one fitting the description given by the callers. They then began searching the building for suspicious people and packages. As employees waited in the marshalling area, word began to spread about the reason for the evacuation. Hearing the mention of the oddly dressed men, two people involved came to a realization that their actions may have caused the evacuation, and they told security officers. Despite the inconvenience that resulted, KSC Security Chief Calvin Burch praised the employees who reported this incident and said that SGS security responded quickly and appropriately. He said that heightened security reflects an awareness of incidents of terror in recent years the bombings at the World Trade Center, Oklahoma City, Khobar Towers in Saudi Arabia and embassies in Africa, in addition to well-publicized shootings at the Capitol Building in Washington, D.C., and in schools. Though there are current reasons to be wary of terrorist acts, the existence of stringent security is not a recent development at KSC. The most noticeable measure, individual badge checks at guard gates, dates back to the founding of the Center in 1963. Because we are a launch center and have the kind of assets and activities we have here, we probably have one of the more visible security programs within NASA, Burch said. Thats a program thats been in place since the beginning of time, if you will. We want to make, from a security standpoint, a very safe atmosphere for employees to do their jobs. Security officers at the three gates entering KSC check approximately 20,000 badges during an average day. The Center uses a practice of increased scrutiny as people move closer to the primary space flight assets, including further badge checks and limited access and mechanical card readers in such sensitive areas as the Vehicle Assembly Building and the Space Station Processing Facility. KSCs security strategy, Burch said, is intended to make the potential for damaging incidents less likely as one moves deeper into the Center. If a threat does arise, the goal is to catch it at the perimeter of the Center as far from employees and valuable equipment as possible. Space Gateway Systems (SGS) is responsible for implementing many of the day-to-day security measures at both KSC and CCAFS under a consolidated support contract. SGS Security Officers must successfully complete a formal training program that meets the requirements of the U.S. Department of Justice. Additionally, all SGS Security Officers meeting this training requirement are designated as Federal Officers and have Federal Arrest Authority. Officers performing Law Enforcement and Special Weapons and Tactics (SWAT) functions must undergo continuous and often arduous training and be certified in their specialty areas. Training is periodically conducted with the Federal Bureau of Investigation and other federal, state and local agencies. The recent incident at the Headquarters Building came at a time when KSC was making the transition to a lower threat condition rating and did not affect the change in security status. Since September 1998, KSC has been in Threatcon Alpha, the first of four levels of heightened security that can be declared in response to perceived threats. While some other centers have been in Threatcon Bravo during that period, Burch notes that KSCs Alpha status includes security practices other centers adopt only for Bravo or higher status. Burch said that at times in the past KSC has taken measures reflecting Threatcon Charlie, although the status wasnt publicly declared. In determining Threatcon status, KSCs security office works with the 45th Space Wing and NASA Headquarters. KSC can independently raise its status but must receive approval from NASA to downgrade the status. The recent move to Threatcon Normal occurred after Burch (in coordination with the 45th Space Wing) recommended the change to Center Director Roy Bridges, who then gained concurrence from NASA Headquarters. The new status does not bring any dramatic changes in KSCs security measures. Burch emphasized that KSC will be no less safe as a result of the status change. Our intent is to maintain a highlevel security program every day and be able to respond to any incidents that could occur and sometimes do occur, he said. 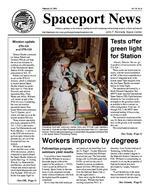 Page 5 SPACEPORT NEWS February 25, 2000 Mark your calendars: The 37th Space Congress is scheduled for May 2-5 in Cape Canaveral. The theme for this years gathering, Space Means Business in the 21st Century, reflects the trend toward commercialization and privitization in space launching. Ed Gormel, executive director of KSCs Joint Performance Management Office, will serve as the panel chairman for the opening discussion: Years of Space Exploration. Other KSC officials scheduled to participate in presentations include Dr. Gale Allen, Technology Programs and Commercialization System; Nancy Bray, Joint Performance Management Office; Gregg Buckingham, University Services; Dr. James Brown, associate director for Logistics Systems; Shannon Bartell, deputy director of SpaceKSC officials committed to 37th Space Congress The NCAA basketball tournament, widely known as March Madness, involves competitions at regional sites leading to an eventual national champion. For the second consecutive year, KSC will be involved in a springtime tournament with a similar structure. The Center will host the FIRST 2000 Southeast Regional Competition, a high school robotics showdown to be held March 9-11. Twenty-three teams are scheduled to compete in the Southeast Regional, with 15 of the Florida teams co-sponsored by KSC. In preparation for the contest, KSC had 18 employee mentors working with members of local teams. Competing teams include students from Astronaut, Titusville, Rockledge, Cocoa Beach, Eau Gallie, Satellite, Palm Bay, Melbourne, Bayside and Melbourne Central Catholic high schools. The FIRST organization (ForCenter prepares for robot invasionInspiration and Recognition of Science and Technology) was founded in 1989 by New Hampshire entrepreneur and inventor Dean Kamen. The non-profit organization brings together business, education and government entities in programs designed to engage youngsters in the areas of science, engineering and technology. Brevard County first entered the competition in 1997 with the formation of the Space Coast Team. The involvement of local schools and industry sponsors grew in 1998, and KSC took part last March by hosting the regional competition for the first time. In addition to hosting the event again, KSC has awarded 20 grants of $5,000 each this year to help Florida teams make entries. The contest matches students from high schools with mentors from businesses and other organizations. Each team is given theStudents from Titusville and Astronaut High Schools were among those who took part last year in the FIRST Robotics Competition regional event at the KSC Visitor Complex.same package of components from which a robot must be created. Once assembled, the robots compete against each other in a series of exercises before a panel of judges. The winners from the regional competitions advance to the national tournament. The contests will take place in the Rocket Garden at the KSC Visitor Complex. KSC is still seeking volunteers for both technical and non-technical dutues from March 7 through the end of the competition. Shifts last 4-5 hours. Volunteers must attend an orientation dinner meeting on March 7 at 6 p.m. in the Early Space Exploration building. Volunteers will be given FIRST T-shirts. To volunteer or for more information, contact Patricia Ermerins at 867-2363. Information also is available at the FIRST Web site: www.usfirst.org. Station and Shuttle Payloads; and Roy Bridges, KSC center director. Exhibits and a science fair are also planned for the event. The 37th Space Congress is sponsored by the Canaveral Council of Technical Societies. Major KSC contractors, including United Space Alliance and Boeing Co., will be participating. All activities will take place at the Radisson Resort at the Port. Registration will be open May 1 from noon to 5 p.m. at the Radisson. For more information, call 868-1623 or e-mail: spacecongress@spacecongress.org.Potential life-saverKSC Director Roy Bridges signs up on Feb. 15 to give a blood sample in the KSC Bone Marrow Drive at the NASA Training Auditorium. The four-day donor registration drive at KSC and Air Force and contractor locations brought in 1,097 new potential donors a KSC record. Small blood samples were taken from each person, and the blood was sent to a laboratory so that marrow types could be determined. The actual harvesting of marrow occurs only with a donors later consent if the marrow type is matched to that of a patient in need of a transplant. This was the third marrow drive at KSC and the first since 1997. The drive was co-sponsored by KSC and the American Red Cross. SPACEPORT NEWSFebruary 25, 2000 Page 6 Martha Williams, with her husband Robert, right, meets NASA Administrator Dan Goldin last March after receiving her Dryden Science Fellowship.Grants ...(Continued from Page 1)ment, Williams said. While at F.I.T., I am studying under the mentorship of a world expert in the flame retardancy of polymers. I couldnt have received that expertise here its a very specialized field of study. Williams is an example of the many KSC employees who have benefitted from the NASA Fellowships Program, which provides the opportunity for both longand short-term study at academic or commercial institutions. The program serves as one tool by which KSC prepares its workforce for a greater emphasis on research as part of the Spaceport Technology Center concept. The awarding of NASA fellowships is a highly competitive process. In Williams case, she came out on top among several applicants from KSC and then traveled to Washington, D.C., to face an interview with officials from NASA Headquarters, Johnson Space Center and contractor Lockheed Martin. Her reward in addition to the fellowship itself was a trip to Washington last March for the Annual Goddard Memorial Dinner, at which she met NASA Administrator Dan Goldin. Three KSC employees received fellowships this year in the most recent cycle of awards. Jennifer Murray of the engineering development directorate received the George M. Low Memorial Engineering Fellowship, Gale Allen of Engineering Development was chosen to participate in the Senior Executive Seminar at CarnegieMellon University, and Catherine Alexander of the Joint Performance Management Office was chosen for the executive seminar Leading with Impact: Linking People, Strategy, Results at Penn State University. Murray, like Williams, received grants of $10,000 from NASA and $2,000 from the National Space Club. She plans to pursue her doctorate degree in electrical engineering with an emphasis on biomedical digital image processing beginning in September. Murray, who holds a masters in biomedical engineering from the University of Miami, said her research will have applications in such areas as landing systems for aircraft, automatic detection of gases, and the early detection of breast cancer. She is particularly interested in the use of biomedical sensors with application toward image processing utilizing 1-, 2and 3-dimensional techniques Im really excited about this opportunity, said Murray, a NASA/KSC employee for nine years. Im looking forward to dedicating myself to full-time research, and Im looking forward to coming back and applying it to a major NASA research area. In addition to Williams, Mike ONeal of the advanced development and Shuttle upgrades directorate was the recipient of a fellowship in 1999. ONeal took part last June in the Senior Executive Seminar at Carnegie-Mellon University in Pittsburgh, Pa. The Senior Executive Seminar is an annual three-week program at Carnegie-Mellons School of Urban and Public Affairs. The program emphasizes management concepts, analytical techniques and human behavior in organizations, with the goal of developing greater leadership skills. While fellowship recipients are nothing new at KSC, Williams pursuit of a doctorate in chemistry is somewhat unusual for the Center. Engineering, rather than science, is the more typical course of study. Williams, who has worked at KSC since 1989, specialized in the analysis of a variety of materials, including those used in the Space Shuttle and launch facilities. As part of her Dryden Fellowship, she now works in concert with Langley Research Center to study flammability, degradation and the effects of fire on specific polymer materials, including a foam material proposed to be used in the Reusable Launch Vehicle program and future launch structures. Having completed her year of full-time study, Williams now alternates between classes at F.I.T. and her research work at KSC. She hopes to complete her doctorate program in a three-year span; such doctorates can require four to five years. Its been very difficult but very positive, Williams said. (Professors) dont cut me any slack. Although I work for NASA, I still have to meet all the requirements of other doctoral students, such as getting in research proposals and taking qualifying cumulative exams. NASA has not yet issued its call for applications for the 2001 awards. For general information about the Agencywide Training and Development Program, call Loretta Dreier at 867-9246 or consult the following Web site: www.hq.nasa.gov/office/codef/ codeft/ The Brevard County Commission recently adopted a resolution recognizing the efforts of all those involved in the 50-year history of space launches in Florida. The resolution reads as follows: Whereas, the first space launch from Florida occurred on July 24, 1950, and the first U. S. satellite in orbit was launched from Florida on January 31, 1958: and Whereas, the American in space was launched from Florida May 5,County Commission pays tribute to space pioneers1961, and the first American to orbit the earth was launched from Florida on February 20, 1962: and Whereas, the first human to set foot on the moon was launched from Florida on July 16, 1969, and few events of the past 1,000 years have affected so many lives so dramatically as the departure from the planet earth: and Whereas, over the years, many of Brevard Countys residents have been a part of the team which has launched man into the new millennium with space flight: and Whereas, in recognition of the great events of the last millennium, The Board of County Commissioners wishes to pay homage to the women and men of Brevard County, Florida, U.S.A. NOW, THEREFORE, BE IT RESOLVED THAT THE BOARD OF COUNTY COMMISSIONERS OF BREVARD COUNTY, FLORIDA, does hereby unanimously recognize and commend THE WOMEN AND MEN OF BREVARD COUNTY WHO MADE IT POSSIBLE FOR MAN TO MAKE HIS FIRST STEPS INTO THE WORLDS BEYOND THIS PLANET EARTH and express its appreciation for their dedicated service to our County, State and Nation. DONE, ORDERED, AND ADOPTED, in regular session, this 1st day of February, AD, 2000. John F. Kennedy Space Center Managing editor. . . . . . . . . . . . . . . . . Bruce Buckingham Editor. . . . . . . . . . . . . . . . . . . . . . . Gary White Editorial support provided by InDyne Inc. Writers Group. NASA at KSC is located on the Internet at http://www.ksc.nasa.govUSGPO: 533-128/00026Spaceport News Spaceport News is an official publication of the Kennedy Space Center and is published on alternate Fridays by the Public Affairs Office in the interest of KSC civil service and contractor employees. Contributions are welcome and should be submitted two weeks before publication to the Media Services Branch, AB-F1. E-mail submissions can be sent to Gary.White-4@ksc.nasa.gov SPACEPORT NEWSFebruary 25, 2000 Page 8 Visitor Complex unveils exhibits, Debus facility NASA Administrator Daniel S. Goldin announced recently that the Agency would merge the Chief Technologists office with the Office of Aero-Space Technology to better focus the Agencys strategy for maintaining its longterm technology base. Chief Technologist Samuel Venneri will retain that position while becoming Associate Administrator for Aero-Space Technology. He will succeed Lt. Gen. Spence (Sam) Armstrong, USAF (Ret. ), who will become senior advisor to the administrator. Gen. Armstrong will be instrumental in leading the Agencys transition from operations to cutting edge research and development, said Goldin. Gen. Armstrong led the revitalization of the Aerospace Technology Enterprise, and it is with great enthusiasm that I have asked him to take on this new assignment. Armstrong will spearhead a new initiative that will allow the AgencyNASA moves four officials into new positionsto create new synergies with universities, industry and other scientific and technical agencies. He will work with academia and industry both aerospace and non-aerospace to identify new opportunities for NASA partnerships. He will also coordinate NASAs plans with the Department of Defense, Federal Aviation Administration and other agencies to ensure that NASAs activities are integrated with those of other agencies and that NASA establishes government-wide partnerships where appropriate. Goldin also announced the following personnel appointments: W. Brian Keegan has been appointed chief engineer. Orlando Figueroa has been appointed Deputy Chief Engineer for Systems Engineering. Dr. Mary Cleave has been appointed deputy associate administrator (advanced planning) for the Office of Earth Science. In the combined position, Venneri will be the administrators principal advisor on Agency-wide technology issues. Under Venneri, the Office of Aero-Space Technology will be charged with developing integrated, long-term, innovative Agency-level technology for aeronautics and space. Venneri will also be responsible for developing new commercial partnerships that exploit technology breakthroughs, and for establishing and maintaining technology core competencies at the NASA Centers. Venneri has been NASAs Chief Technologist since 1996. As you approached the Kennedy Space Center Visitor Complex on Feb. 19, the sparkle of neon lights and aroma of wonderful food set the scene for the start of an outstanding event to showcase four new exhibits at Kennedy Space Center. The opening of these new interactive, hands-on exhibits to enthuse and educate visitors marked the final phase of a more than $120 million redevelopment project by Delaware North Parks Services of Spaceport, Inc. The event began at the unique conference facility, featuring a birds-eye view of the beautiful, three-acre Rocket Garden. The Dr. Kurt H. Debus Conference Facility, named for KSCs first director, is located within the new Early Space Exploration building. A separate exhibit is dedicated to the historical missions that paved the way for our current Space Shuttle program. The futuristic exhibit, called Exploration in the New Millennium, takes visitors on a journey into a bold vision of human exploration beyond Earth in the coming centuries. The guests receive an Interplanetary Exploration Passport filled with intriguing space questions that are answered as they arrive at the various stamping stations throughout the exhibit. The exhibits include threedimensional views of Mars, a piece of Mars rock that fell to Earth as a meteorite and an entertaining presentation of technologies which may take us to the stars. After guests had taken time to enjoy the new exhibits and wonder in the creative approach to explain space travel, the evenings speakers were introduced by event master of ceremonies, astronaut Rick Searfoss. The evening was topped off by the introduction of the most exciting guest opportunity now available daily Astronaut Encounter. The live show is aimed at inspiring children to strive for excellence through hard work, dedication and education. The evenings astronauts were Gene Cernan and Wally Schirra. During this innovative show, guests viewed mission briefings, video footage, space artifacts and have the once-in-a-lifetime opportunity to ask questions and receive answers of personal stories of space travel by those who lived it. It is inspirational to feel the childrens inspiration as they see these exhibits, said Gene Cernan. It is important to give children the tools to pick up where we left off. The overall vision of all the speakers is the future of the space program and the important role children and young adults play in the exploration of space. The goal is to inspire young people to search for the mystery of life, Center Director Roy Bridges said. These exhibits will encourage children to continue this journey and learn the fun of exploring.Ute Debus, left, and Sigi Debus Northcutt were on hand for the dedication of the conference facility to their father, Dr. Kurt H. Debus, KSCs first director.